Each and every project is the independent creation of someone like you. Projects are big and small, serious and whimsical, traditional and experimental. They’re inspiring, entertaining and unbelievably diverse. We hope you agree... Welcome to Kickstarter!" A project by Ramos creates vintage-looking desktop radios with digital readouts made of nixie tubes and large LEDs. With this project, higher levels of funding pledges gets you various radios if successful. For instance, a pledge of $350 gets you a Nixie Ramos radio. As the mission statement says, you risk nothing if the funding goal is not met, so you can essentially place an order for a radio and lose nothing if the funding goal is not met. That, of course, doesn't necessarily mean that you cannot get the proprietor to build one for you outside of the purview of the project once it's over. Funding goal: $75,000US. Total pledged: $146,076US by 503 backers. This project is still open, with 33 hours to go as of this writing. Zac Manchester is a Ph.D. student in Aerospace Engineering at Cornell University. He has developed KickSat, which is a standardized SuceSat filled with his Sprite transmitters. "My goal is to bring down the huge cost of spaceflight, allowing anyone from a curious high school student or basement tinkerer to a professional scientist to explore what has until now been the exclusive realm of governments and large companies. By shrinking the spacecraft, we can fit more into a single launch slot and split the costs many ways. I want to make it easy enough and affordable enough for anyone to explore space." "After the Sprites are deployed from KickSat, we will track them and record their radio signals using a worldwide network of amateur ground stations to demonstrate their communication capabilities. We will also gather data on how long the Sprites stay in orbit and how well their electronics hold up in the harsh space environment." Funding goal: $30,000US. Total pledged: $74,586 US by 315 backers. The project reached its goal and is now closed. Nice! BoardX, brainchild of Virginia Tech engineering student Kevin Green, is a great example of a successful project. "BoardX is a collection of electronic circuit boards that stack on top of one another to share resources, communicate, and extend the functionality of one another. This system is built on the motherboard that acts as both an electrical and structural foundation." 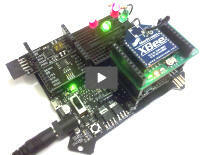 The picture shows a MaxStream (now Digi) XBee ZigBee module as a second-tier daughterboard that provides a means to program the motherboard wirelessly. The stated reason for needing funding: "I need funding because I want to price these boards as low as I can so that everybody can afford one. Unfortunately, it just isn't possible unless I buy a lot of these boards and have them assembled in a factory." Funding goal: $5,000US. Total pledged: $13,114US by 103 backers. The project reached its goal and is now closed. If you are not the inventor type, but would like to help motivate those who are, you should consider supporting a project or two. You take delivery of something tangible if the project is successful and lose nothing if it is not.